Sony have seriously misjudged the backlash with the up and coming firmware upgrade, and the over the top price X70 owners are having to pay for a measly licence that many of us insist should have shipped with the camera from day one. Assuming you need 4K 25p, 420 8bit footage you are expected to pay Sony a further 485 Euros for the pleasure…no chance. At least two of my colleagues own two X70s and they are thinking of now selling them on as the price for 2 licences… a whopping 970 euros is far too dear in their opinion. This is turning into a “Marketing Disaster” for Sony Broadcast and I for one will not be paying 485 euros for any 4K 25p frame rate. Panasonic on the other hand recently gave all their Panasonic PX270 users a late Christmas present by giving away their AVC Ultra 200 codec for free, when it was rumoured to cost at least 2500 euros. I love my PXW-X70 and XAVC HD 1080 50p works fine for me but a lot of disgruntled X70 users are becoming very angry at not only the time it has taken Sony to arrive at the 4K licence price but the unfairness of it all compared to the AX100 ! Does anyone think we are going to get top notch 4K footage at 60Mbps when Sony have already announced a FW update for the domestic AX100 upping it to 100Mbps…sorry but I really feel so angry that Sony Broadcast think professional camera operators will put up with this outrageously bad afterthought when their domestic partners are walking all over us…seriously very poor marketing Sony Broadcast !!! What were we waiting for, the price, we knew that would be over the top and we were right. I thought Sony were working on some amazing professional codec that would give us a minimum 150-200 Mbps XAVC 4K, after all…We the end user bought into the fact that our X70s are “professional camcorders”. I also hoped we would get other codecs like XAVC I for HD work, allowing me to bypass Catalyst Prepare. SDXC speed 3 cards would cope with 150Mbps easily I use them in my X70, A7s and GH4 all the time. Sonys announcement was a roller coaster for me but to pay so much for so little in return is not cricket. 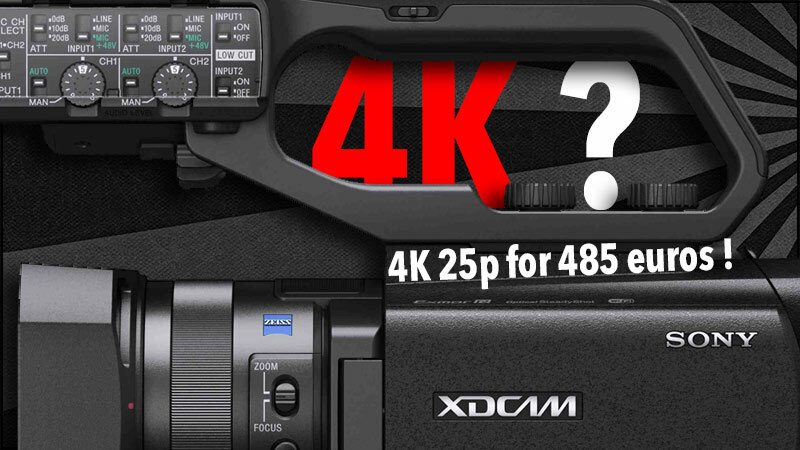 Update : Before we go into the realms of fantasy the X70 is a 422 10bit HD camcorder but is not capable of processing 422 10bit 4K footage, thats why you buy an FS7 ! 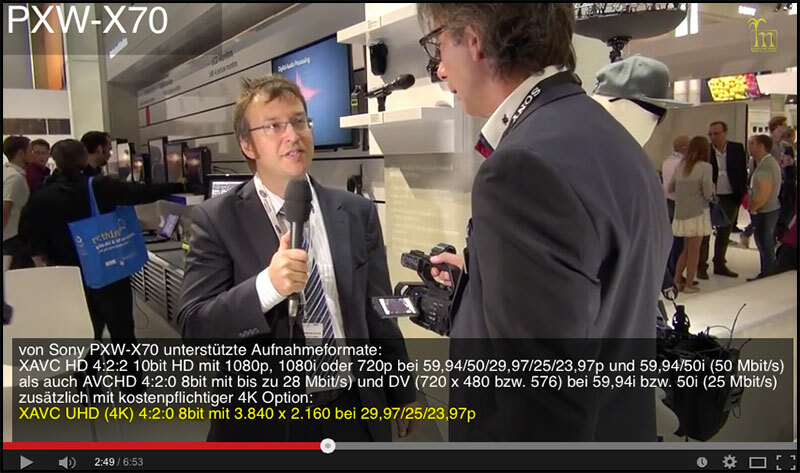 Why are we still bickering about 422/420, this video has been pointed out to me as a “Sony said 422” yet in the same German video there is a graphic stating quite clearly UHD is 420 8bit, this was recorded during IBC 2014. 4K in the PXW-X70 is 420, 8bit end of story. you know what? You are actually right: the “reviewers” said that the 4K upgrade was most likely a paid one. Sony never said anything about it as far as I know (but I may be wrong of course). So Mark you are saying that Avid is not a ‘real’ editor.’ BTW it handles the XAVC codec as does Premiere Pro CC 2014 and Edius 7.5. As I said Vegas will handle it end of the month thereabouts and FFCPX the latest kid on the block should have XAVC compliance in the not too distant future.